Israel's Netanyahu Says He Is 'Determined To Speak Before Congress' : The Two-Way The Israeli prime minister said his country has a "profound disagreement" with the White House on nuclear talks with Iran, and it is his duty to speak up on an issue that affects Israel's survival. Israeli Prime Minister Benjamin Netanyahu attends the weekly Cabinet meeting in his Jerusalem office on Feb. 8. Israeli Prime Minister Benjamin Netanyahu said today his country has a "profound disagreement" with the White House on Iran and he is "determined to speak before Congress" on March 3 on the Islamic republic's nuclear program. "I am going to the United States not because I seek a confrontation with the president, but because I must [fulfill] my obligation to speak up on a matter that affects the very survival of my country," Netanyahu said in a statement. In the statement, Netanyahu noted "serious disagreements" between past U.S. and Israeli governments, saying, "None of these disagreements led to a rupture in the relationship between Israel and the United States. In fact, over time, our relationship grew stronger. "But we do have today a profound disagreement with the United States administration and the rest of the P5+1 over the offer that has been made to Iran. 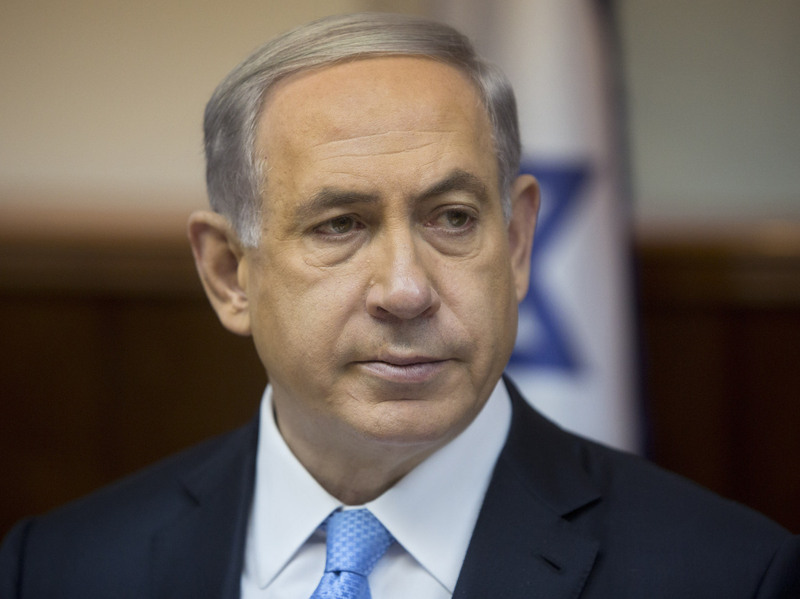 This offer would enable Iran to threaten Israel's survival." The P5+1 refers to the five permanent members of the U.N. Security Council — Britain, China, France, Russia and the United States — plus Germany. They are engaged in talks with Iran on its nuclear program. The West says Iran is pursuing nuclear weapons, a charge Tehran denies. Israel views Iran as an existential threat. The dispute over Netanyahu's speech began last month when House Speaker John Boehner invited the Israeli leader to address Congress. The White House was not consulted about the invitation and called it a departure from diplomatic protocol. Obama, citing the proximity of Israel's March 17 election, said he wouldn't meet with Netanyahu while the Israeli leader is in Washington. "We have a practice of not meeting with leaders right before their elections, two weeks before their elections. As much as I love Angela, if she was two weeks away from an election, she probably would not have received an invitation to the White House — and I suspect she wouldn't have asked for one." As NPR's Jackie Northam reported: "Obama and Netanyahu have developed a prickly relationship over the past few years." Valerie Jarrett, Obama's senior adviser, told NPR's Renee Montagne in an interview that will air Wednesday on Morning Edition that the president has had several conversations with Netanyahu on the issue. "This is not a space where personal feelings are appropriate," she said. "This is a space where the president is doing what he thinks is in the national interest of the United States and which he also thinks is in the security interest of Israel." Obama said he has "very real differences" with Netanyahu over Iran, but added that U.S.-Israeli relations should go beyond Likud, Netanyahu's political party, and the GOP. Still, Netanyahu's planned speech to Congress has irked many Democrats. Vermont Sen. Patrick Leahy, the longest-serving lawmaker in the Senate, said he would skip the speech, calling it "a tawdry and highhanded stunt that has embarrassed not only Israel but the Congress itself." The state's other senator, Bernie Sanders, an independent, is also skipping the speech. Several House Democrats have also said they won't attend. There is bipartisan support in Congress to impose more sanctions on Iran, but Obama has threatened to veto any sanctions, saying diplomacy must be given a chance to work. Netanyahu's planned speech has also been criticized in Israel, where opponents say the prime minister is damaging ties with Israel's closest ally in order to boost his electoral prospects.